Data Entry Operator - Salary consolidated pay - 12th Std Pass (HSE / Class XII / 10+2) with Tamil and English Typewriting Junior Grade ; Certificate Course in Computer Applications - Age 35 years - Recruitment by temporary basis. Filled applications to be submitted to the same office on or before 28th May 2015. Roaster Systems will be followed as per govt norms. Application Fees Rs.500 for BC / MBC / UR and Rs.250 for SC / ST / PH enclosed by Demand Draft in favour of "The Registrar, Periyar University, Salem-11" and Payable at "Salem". Applications submitted in 8 set of copies. Instructions :BPharm Candidates are requested to verify their rank list from district employment office, immediately. Data Entry Operator - 8 Posts - 12th Std Pass (HSE / Class XII / 10+2) with Tamil and English Typewriting Junior Grade ; Certificate Course in Computer Applications - Age 35 years - Recruitment by temporary basis. Application Fee Rs.100 for OBC / UR candidates ; all others FREE. Fee should be paid by Demand Draft in favour of "Joint General Manager (Finance), BIOM, Kirandul Complex, Kirandul" payable at Kirandul. Application can be prepared by yourself with details. All above posts are under contract basis appoint for one year, extension allowed based on their performance. Application Fee Rs.250 for SC / ST and all others Rs.500 by Demand Draft. Applications are invited for the post of Company Secretary vacancy in Urban Finance and Infrastructure Development Corporation Ltd (TUFIDCO) Chennai under direct recruitment process. Programmer - 18000 pm - B.E./B.Tech./M.Tech. (Comp.Sc./IT/Electronics & Comm.) in 1st Divn. Or M.Sc. 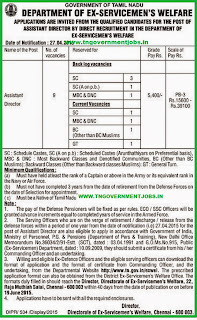 (Comp.Sc./IT) in 1st Div. Or MCA in 1st Divn. Or 'B'/'C' Level course from DOE in 1st Divn. Or M. Sc (Phy/Math/Statistics) in 1st Divn. with PGDCA in 1st Divn and ii) Project work of Software Development in a reputed company on .NET or Java/J2EE/Websphere, MySQL and Linux/VB and MS Access/SQL Server/Oracle. Professor (Commerce) - 2 Posts - Basic Pay 34700 Academic Grade Pay 10000 in Pay Band IV category - Qualifications as per UGC norms. Professor (Buddhist Studies) - 1 Post UR - Basic Pay 34700 Academic Grade Pay 10000 in Pay Band IV category - Qualifications as per UGC norms. Associate Professor (Buddhist Studies) - 1 Post UR - Basic Pay 34700 Academic Grade Pay 9000 in Pay Band IV category - Qualifications as per UGC norms. Assistant Professor (Buddhist Studies) - 2 Posts (UR ; SC) - Basic Pay 15600 Academic Grade Pay 6000 in Pay Band IV category - Qualifications as per UGC norms. 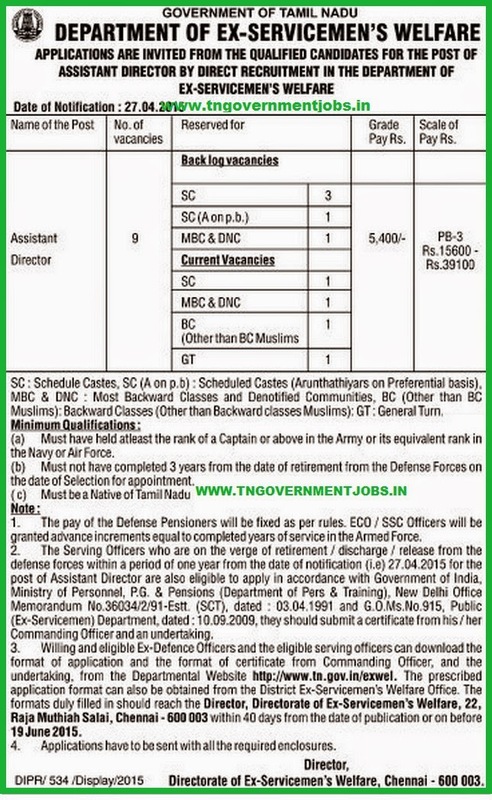 Assistant Director - 9 Posts (1 UR ; 1 BC ; 2 MBC ; 4 SC ; 1 SC Arunthathiyar) - Basic Pay 15600 Grade Pay 5400 in Pay Band III - Should be served as CAPTAIN rank in Army / Navy / Indian Air Force ; Should not complete 3 years period from the date of retirement ; Must be a Tamilnadu resident. Candidates should have live in Tamilnadu domicile. Should be worked in Captain level rank in defence service. Prescribed Applications forms are available in official website and in the Directorate Office.